Many users have faced low memory problem because they have installed too many apps and some app especially Social networking cannot be moved to internal storage due to which their System storage of 1gb gets fulled. In this post I will tell you the Method to Increase the System Storage i.e usually of 1gb by default. It is also for those who have done partition through Meteos app and now not able to install awesome ROMs like Spice_Gionee or Note 3. 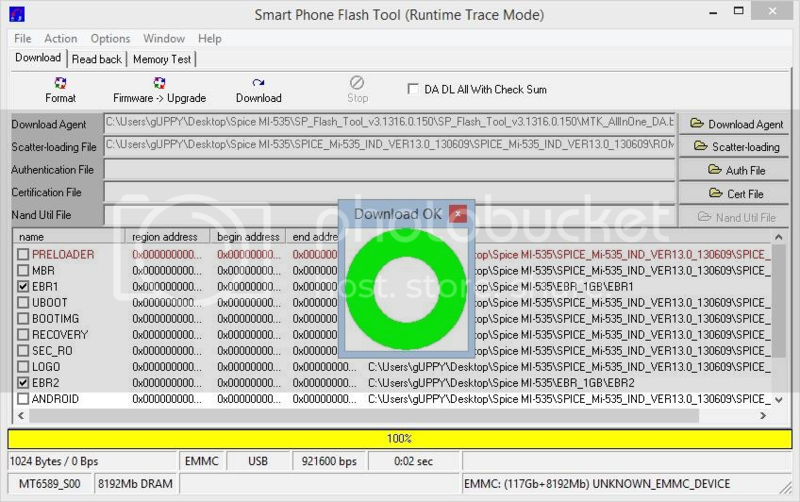 This Method Works on any ROM ported for Spice MI-535 including Stock ROM version 12 ,13 and 14 also. 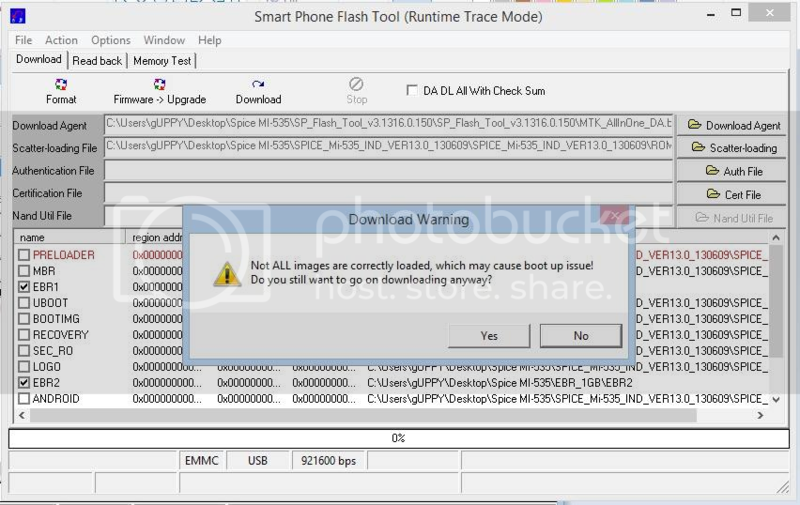 NOTE --- For this method your phone should be rooted and any Custom Recovery like CWM or TWRP should be installed. Your Battery should be atleast 50% charge. By this method your memory will get formatted , so backup all you data and apps ( use titanium backup to backup apps , method to use Titanium Backup is in the pinned post of this Group ). 1.If want to increase the system storage by 1gb then download the both EBRs ( EBR1 and EBR2 ). After applying this ,System storage will become 2gb and internal storage will become 11.5 gb. 2.If want to increase the system storage by 1.5 gb then download the both EBRs ( EBR1 and EBR2 ). After applying this ,System storage will become 2.5gb and internal storage will become 11gb. 3.If want to increase the system storage by 2gb then download the both EBRs ( EBR1 and EBR2 ). After applying this ,System storage will become 3gb and internal storage will become 10.5 gb. 4.If want to increase the system storage by 2.5gb then download the both EBRs ( EBR1 and EBR2 ). After applying this ,System storage will become 3.5gb and internal storage will become 10gb. 5.If want to increase the system storage by 3gb then download the both EBRs ( EBR1 and EBR2 ). After applying this ,System storage will become 4gb and internal storage will become 9.5gb. 6.If want to increase the system storage by 3.5gb then download the both EBRs ( EBR1 and EBR2 ). After applying this ,System storage will become 4.5gb and internal storage will become 9gb. If want to get back the default system storage i.e 1gb then download the both EBRs ( EBR1 and EBR2 ). After applying this ,System storage will become 1gb and internal storage will become 12.5gb. Those who have done partition through meteos app and want to try this method , I will recommend to first do your system storage default i.e 1gb using above default EBRs and then select the EBRs according to size you want. Now Download the Stock ROM version 13. Link given below. After Downloading the stock ROM version 13 , Extract it. Now after downloading the EBRs of the size you want and Stock ROM ( Extracted ), copy them on your computer's desktop. 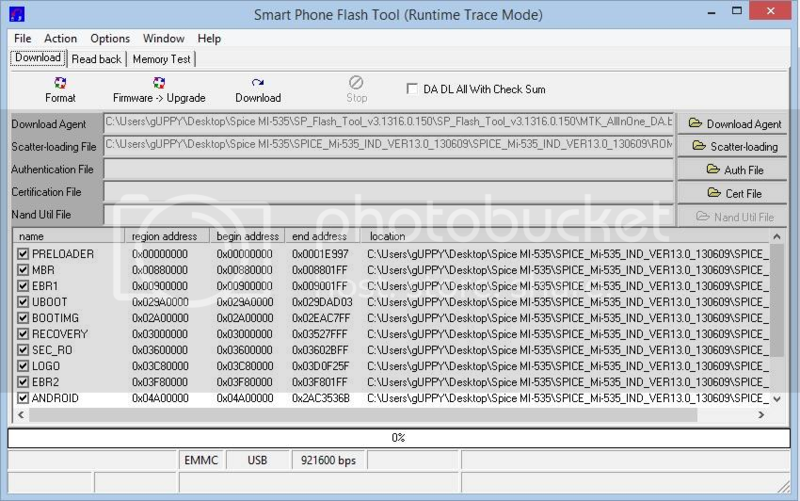 Now Open the Sp flash tool. ( make sure you have installed the drivers of your phone ). 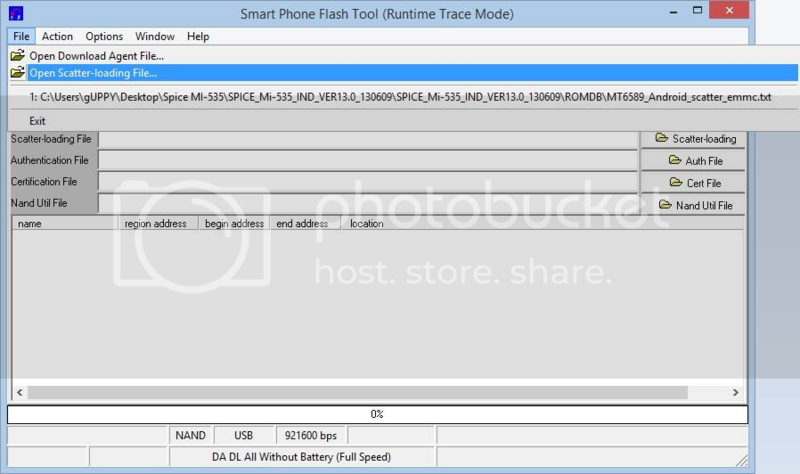 After opening the flash tool go to the " file " option as shown in the photo. Now select the option " Open Scatter-loading File " as shown in the pic. 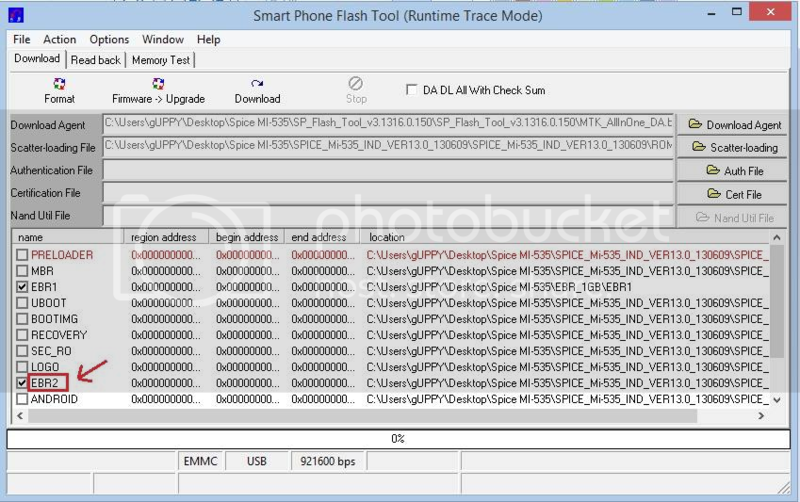 Now browse to the Extracted folder of Stock ROM version 13 and select the scatter file inside the Stock ROM folder. After selecting the scatter file , you will see like this. Now Important , un-check all the Tick marks except EBR1 and EBR2 as shown in the pic. Now after doing the above step , double click on the portion between the red rectangle as shown in the pic. 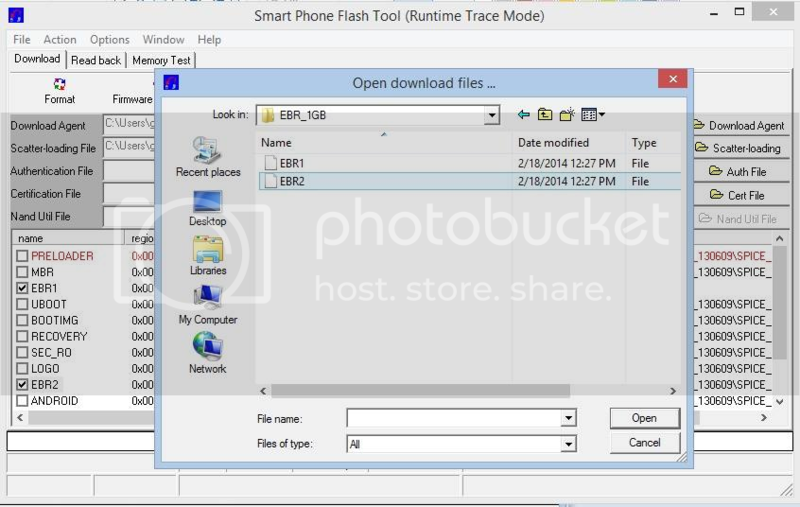 After doing double click , browse to EBR1 file that you have downloaded and copied to your computer desktop and select it. After selecting EBR1 , do the same for EBR2 i.e double click on the portion between red rectangle as shown in the pic. 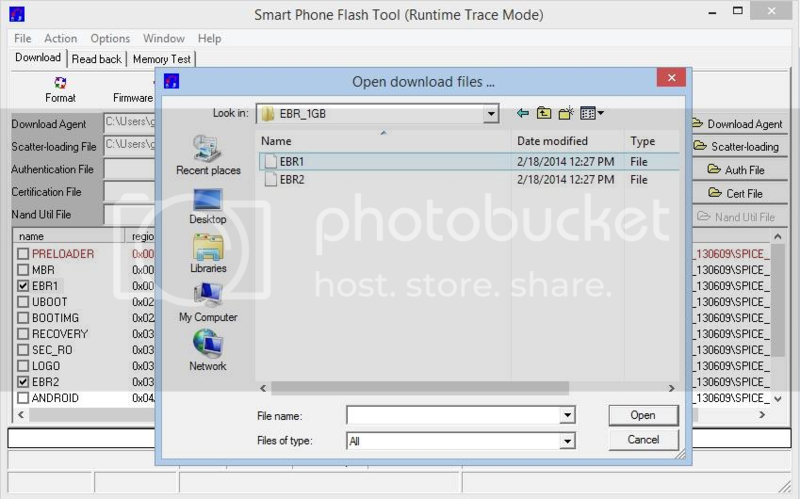 After doing double click , browse to EBR2 file that you have downloaded and copied to your computer desktop and then select it. 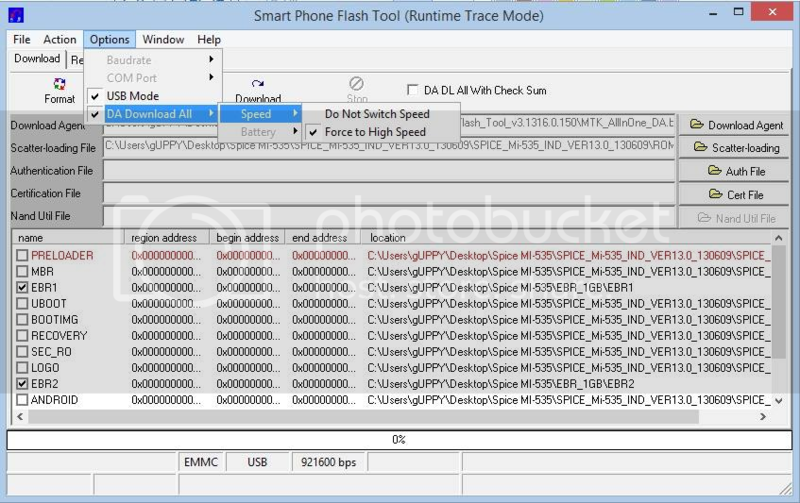 After doing the above step , go to " Options " as shown in the pic and make sure that " USB Mode " and " Force to High Speed " are checked. Now click on the " Download ". After selecting the Download you will get a Message as shown in the pic. Click on " Yes ". Now , switch off your Phone and go to the Recovery by pressing Power and Volume Up Simultaneously. Then your phone will enter into the Recovery menu. There you will see " Backup & Restore " option. Select it and then select " Backup ". Now the recovery will take Backup of your ROM. After the Backup gets complete. 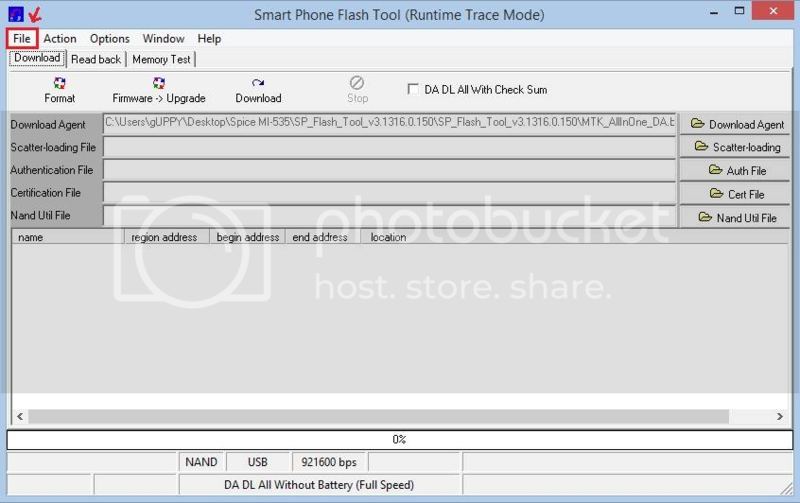 Remove your Battery , SD Card and SIM. Now connect your phone using Data cable to the Computer. 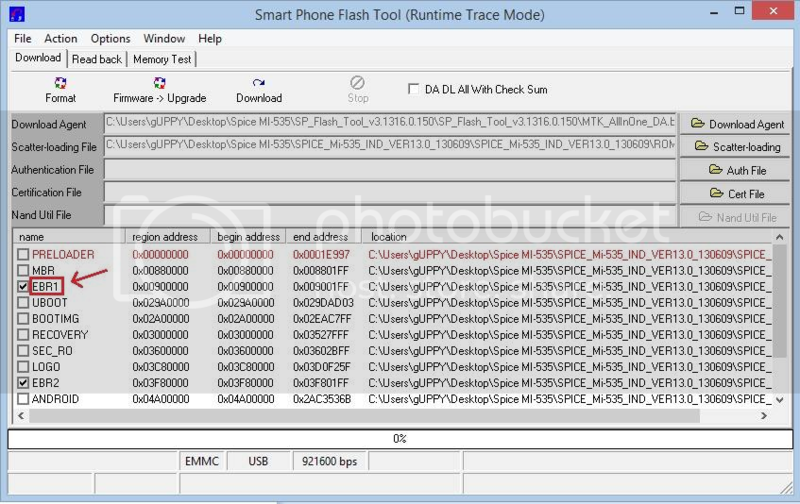 After connecting your phone there will be some process take place. After the process complete , you will see like this. A Green Circle as shown in the pic. Now detach your phone from the computer , and then put the Battery and memory card back in your Phone. ## Now very very Important Step , after putting back the Battery and SD card , press the Volume up and power button. ( means you have to go to the recovery again ). Note-- Do not start your phone by only power button. Now in the Recovery Menu , You will see option " Wipe Data/ Factory Reset. " Select it. Some process will take place. When the process completes , You will see another option like " Wipe Cache ". Select it. Some process will take place. Wait for the process to Complete. Now in the Recovery Menu , go to the option " Backup & Restore ". Select it and then select the " Restore ". Some process will take place. Wait for process to complete. When the Process gets completed , Reboot your Phone. Now format your Internal Memory.CONGRATS , You will find that your System Storage of 1gb gets Increased. Thanks for such descriptive procedure for increasing int. memory of spice mi535, but alas, tried to go as per exact procedure described above, not successful. No,this is for Spice Mi-535 only.